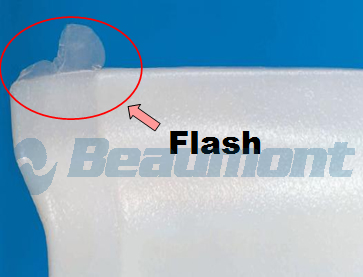 Molding Flash - Beaumont Technologies, Inc. Molding Flash is a thin film of plastic showing at the parting line of the mold or between inserts. A thin film of plastic showing at the parting line of the mold or between mold inserts. This can be caused by an excessive gap between any mating steel halves that are forming the molded part; clamp tonnage may be too low; poorly controlled process resulting in the entire cavity being filled under velocity control (transfer position incorrectly set). If the mold is older, it may be caused by tooling wear or damage. If it is a multi-cavity tool the balance should be checked as cavities can fill at very different conditions. This could be discovered using the 5-step process. Molding simulation could also be used to troubleshoot.